Did you ever ask the question “What can I do to get rid of this belly fat?” or “How can I lose the fat on my thighs?” As a trainer I hear this question often. You can target a muscle through specific exercises, however, you can’t spot reduce. In other words, no matter how many sit ups you do you will never see your muscles if you have an extra layer of fat hiding them. We have no control of where we lose body fat. In order to lose fat over any specific body part, one must follow a proper nutrition plan and have an adequate fitness plan in place. There are no short cuts to being healthy and fit. Working out is only a small portion of your results. A big portion of your success will happen in the kitchen. 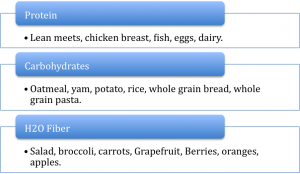 Here are some guidelines to help you eat for life. Most of us are not sure what a portion is. We either over estimate or underestimate our servings. More than likely we are over indulging, which is why some of us can’t seem to lose weight. 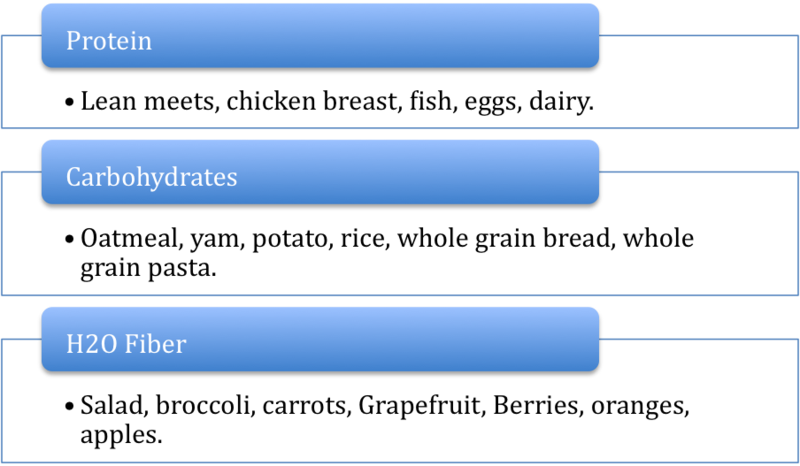 Although our food guidelines may vary depending on our personal fitness goals, in general I recommend eating a palm size portion of a protein, carbohydrate and a fibrous food at each main meal. (breakfast, lunch, dinner). It’s time to plan your meals. Here are a couple examples of how you could pair up your meals for breakfast, lunch, dinner and snacks. The rules are simple. Palm size portion of a protein, carbohydrate and Fiber for your 3 main meals. Eggs, fruit, oatmeal (stay away from pre-packaged oatmeal that is full of sugar). Greek Yogurt, fruit, whole grain bread. Protein Shakes. Be cautious of what you put into your shake or you will end up with a high calorie drink. Example: Protein, water, ice, frozen fruit. Natural Peanut butter and celery. Chicken salad, baked potato. Keep in mind that just because it is a salad, doesn’t mean it’s healthy. Keep it clean; chicken and fresh vegetables. Use dressing sparingly. Turkey sandwich on whole grain bread, apple. Notes: No carbs at snack time or after 6:00 PM. In a nutshell, you can’t spot reduce. You can help eliminate body fat through proper nutrition and exercise. Plan your meals. Drink plenty of water and get some exercise in your day. Stay tuned for part two of can you spot reduce? Having a proper fitness plan can set you up for success. ← Can Meal Planning Help You Reach Your Goals?